Are you not experiencing the pleasure you need and deserve from your current tablet? Do you find that your 10-inch tablet simply isn't satisfying? The Samsung has the solution: not one, but two brand new tablets that offer a fabulous 12.2 inches of diagonal screen real estate. The Galaxy Tab Pro and Galaxy Note Pro 12.2, along with the smaller Galaxy Tab Pro 10.1 and 8.4, are both launching in United States retailers on February 13th. And the screens aren't the only things that are big. If you need a memory refresh, these are the tablets announced last month at CES, complete with a totally new version of Samsung's user interface. All four tablets share some similar core specifications (1.9GHz Exynos 5 Octa processor, 8MP rear camera, 3GB RAM on the 12-inch tablets, 2GB on the smaller Tab Pros, 16-64GB storage plus MicroSD card slots) with the obvious difference being screen technology. All of them use a massive 2560x1600 screen resolution, even on the Tab Pro 8.4, but only the Galaxy Note Pro gets the S-Pen and Wacom digitizer. All four use Android 4.4 with a new UI that looks a bit like Windows 8's Metro start screen. All of them will be available in black and white. 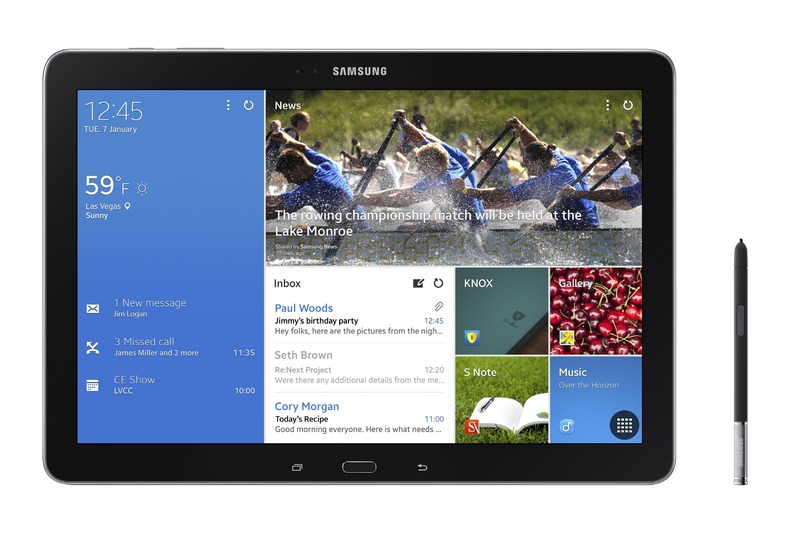 Samsung is marketing these tablets as business machines, and boy, do they mean business. The Tab Pro 8.4 at 16GB is the cheapest of the lot - $400. The Tab Pro 10.1 jumps up to $500 for the basic 16GB model, then a whopping $650 for the 12.2-inch Tab Pro. Finally, the Galaxy Note Pro 12.2 starts at $750 for the 32GB model and jumps to $850 for the 64GB version. At the top of the line, these tablets are starting to compete with premium laptops, and they're easily the most expensive WiFi models on the market. Samsung is boosting the value proposition with the Galaxy Perks package, which includes subscriptions of varying lengths to Hulu, Bloomberg BusinessWeek, Cisco WebEx, two years of 50GB Dropbox space, and a $25 Google Play credit. Even with the add-ons, these are some seriously expensive machines, and the Note 3-style faux leather can't hide the fact that they use Samsung's standard design sensibilities (including physical navigation keys). Samsung will start taking pre-orders tomorrow on its website, and initial retail partners include Best Buy, Wal-Mart, Amazon, Tiger Direct, Fry's, and Newegg. Any takers? 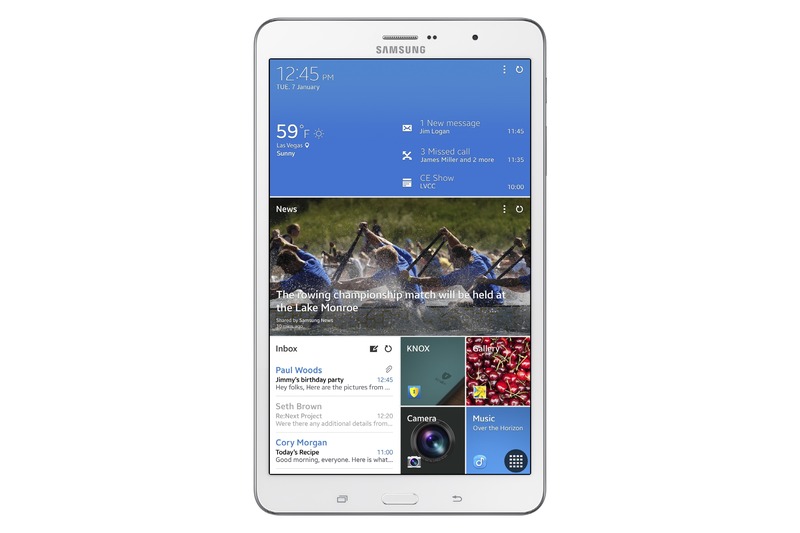 RIDGEFIELD PARK, N.J.--(BUSINESS WIRE)--Samsung Electronics America, Inc. today announced that the Wi-Fi enabled Galaxy Note® Pro 12.2 and Tab®Pro 10.1 and 8.4 will be available in the U.S. beginning Feb. 13. Pre-orders will start at midnight ET, Feb. 4 from Samsung.com, Best Buy, Walmart, Amazon, Tiger Direct, PC Richard and Sons, Fry’s, and Newegg. 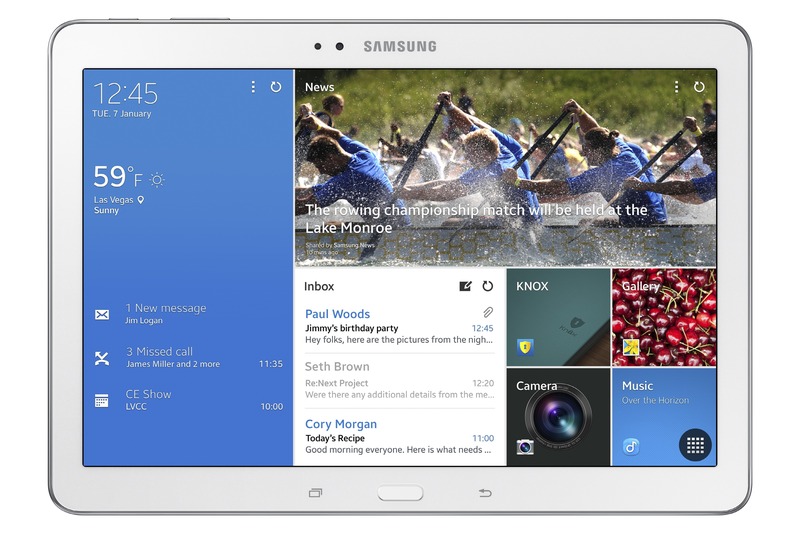 The Samsung Galaxy Tab Pro 12.2 will be available in March 2014. Verizon Wireless will be the first to offer the Galaxy Note Pro 12.2 with 4G LTE connectivity later this quarter. For more information, visit www.samsung.com/us/protablets. 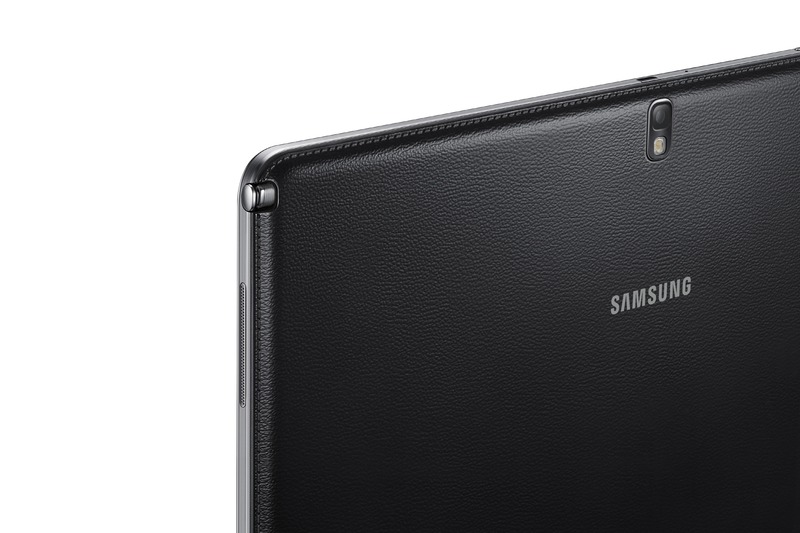 Samsung’s new Galaxy Note Pro and Tab Pro series includes four models – Note Pro 12.2 and Tab Pro 12.2, 10.1 and 8.4. The new tablet lineup features premium materials, a suite of applications and services, unparalleled displays, a unique interface designed to simplify access and discovery of content, and many new productivity tools. The Galaxy Note Pro and Tab Pro series tablets will be available in two color options, black and white. Samsung’s Galaxy Note Pro and Tab Pro 12.2 are the world’s first 12.2-inch tablets with high-resolution WQXGA (2560 x 1600) Super Clear LCDs and widescreen aspect ratios of 16:10, with more than 4 million pixels. Engineered with 3GB of RAM and a larger screen for optimal viewing, the Galaxy Note Pro and Tab Pro 12.2 give consumers the power and screen real estate to view full HD videos and perform various tasks on a dazzling and vibrant display. Developed and designed specifically for the 12.2-inch Note Pro and Tab Pro, Multi Window lets users view up to four applications simultaneously, offering improved multitasking. The Multi Window feature enhances productivity with impressive quick controls, like drag and drop for easy cut and paste and one-touch presets, to quickly launch commonly used Multi Window app configurations. The Galaxy Tab Pro 8.4 display is the most pixel dense tablet on the market. HD video, images and games take full advantage of the high pixel count, giving users a display quality not found on any other tablets in its class. With a Snapdragon 800 2.3 GHz quad core processor, the Tab Pro 8.4 is built to handle high-powered games and video. All tablets in the Note Pro and Tab Pro series are outfitted with Magazine UX, Samsung’s innovative new user interface that’s built right into the home screen layout. This customizable layout brings users’ favorite and most-frequented content—games, notes, apps, e-mail and more—to the forefront, offering direct access to content with a single touch. To enhance productivity and give users a more effective typing medium, Note Pro, Tab Pro 12.2 and Tab Pro 10.1 feature a virtual keyboard that mimics the size and appearance of a physical keyboard, leveraging haptic feedback and hotkeys to offer users a more accurate and familiar typing experience. It includes directional keys and copy/paste functionality built right into the keyboard which allows you to create and edit documents more efficiently. The Note Pro also includes Samsung’s S Pen, offering the precision and responsiveness that customers love, as well as features such as handwriting-to-text, Air Command, and Pen Window. Both the Note Pro and Tab Pro come equipped with applications designed for optimal professional performance and mobile productivity. Remote PC allows easy access and control of a home or office computer directly through a Pro tablet, while a downloadable and touch optimized version of Hancom Office gives users the ability to create, edit and save documents, spreadsheets and presentations with the same functionality you would find on a PC. Samsung e-Meeting provides collaboration capabilities by giving users the ability to share content during a meeting without having to access a central server or network. These devices come with a powerful and productive Samsung accessory ecosystem that includes keyboard covers, the S Action Mouse and USB LAN Hub adapters along with a variety of third party accessories including Bluetooth keyboards from ZAGG, Belkin and Logitech.